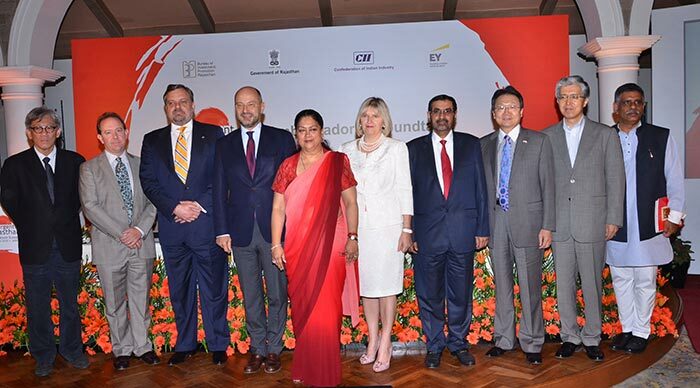 Ever since she took charge in 2013, Chief Minister of Rajasthan, Vasundhara Raje for the first time spoke on the reform and investment push carried out by her government. On November 19-20, Government of Rajasthan is organizing the Resurgent Rajasthan Investors Summit in Jaipur in association with Confederation of Indian Industry (CII). This is going to be an extraordinary event with strategic conferences, panel discussions, round-table deliberations, presentations, roadshows in various parts of India and aboard along with one-on-one business meetings, Signing of MoUs for investments in Rajasthan. With the Resurgent Rajasthan Summit, the government aims not just to garner huge investments but also mingle the state’s strength with that of the investing partners. Raje pressed on the fact that it’s vital for the state to keep the partners enthralled in order to get other people to invest and essentially to invest in areas where the state is keen to bloom, such as in the arenas of manufacturing, IT, textiles, stone, petroleum, mines, etc. This event will be an endeavor to attract investments in the state by reaching out to stakeholders and partners. It will embark Rajasthan’s journey towards sustainable long-term growth and inclusive development. The investments will be used to create jobs, infrastructure and general social happiness. Raje stated that so far the huge sum of investment has come from Japan for the state and now Singapore is also a partner country with whom the state would be looking at development in ITES for hospitality industry. Raje was quite clear while averring that the government’s clear focus is to bring in investments into the state as there is a need for quick development. The government is strategizing to focus on social reforms, social justice for the people and effective governance. The Chief Minister has asked the officials to lessen the number of clearances needed to be sought and stressed on the need to complete tasks in a time-bound manner so that the process of investment turns easier. Important suggestions also came from members of the Chief Minister’s Advisory Committee Mira Mehrishi, Manish Sabharwal, Mohan Das Pai and P P Pareek to promote investment in the state. Meanwhile, Chief Secretary Rajiv Mehrishi, Additional Chief Secretary Infrastructure CS Rajan, Principal Secretary Finance P S Mehra, Secretary Planning Akhil Arora and Commissioner Bureau of Investment Promotion Naveen Mahajan were also present in the meeting. As it comes to the IT industry, at Octal Info Solutions, we offer wide ranging IT solutions in the arenas of web and mobile application development and provide our clients with value added and cost-effective services. With higher return on investment, we cater our clients with what exactly they require. Looking at the rising IT culture in the state, it is quite certain that the investment opportunities are huge and they are bound to grow in the coming time. We have an efficient team handling varying departments of IT and serve clients all around the world with main offices in Rajasthan (India), UK, Singapore and US. Meanwhile, the summit will be held at Jaipur Exhibition & Convention Center, EPIP Sitapura, Jaipur.